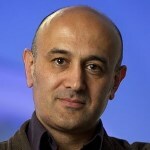 ‘Jim’ or Jameel Sadik Al-Khalili is a theoretical physicist and broadcaster. Born in Iraq, Jim moved to the UK at the age of 17, and earned a PhD in nuclear reaction theory at the University of Surrey. He now holds the post of Professor of Theoretical Physics there. Alongside his academic work, Jim has worked with the BBC in bringing popular science based programming to public attention. His documentaries include a Horizon special on the The Big Bang in 2008 and a detailed look at the workings of CERN’s Hadron Collider in The Hunt for Higgs in 2012. Jim is also a prolific writer, having written six popular science books, including his most recent – Life on the Edge: The Coming of Age of Quantum Biology, and he has contributed to The Collins Encylopedia of the Universe.